General elections were held in Pakistan on Wednesday 25 July, after the completion of a five-year term by the outgoing government. At the national level, elections were held in 270 constituencies, each electing one member to the National Assembly. At the provincial level, elections were held in each of the four provinces to elect Members of the Provincial Assemblies (MPA). As a result of the elections, the Pakistan Tehreek-e-Insaf (PTI) became the single largest party at the national level both in terms of popular vote and seats. At the provincial level, the PTI remained the largest party in Khyber Pakhtunkhwa (KP); the Pakistan Peoples Party (PPP) remained the largest party in Sindh and the newly-formed Balochistan Awami Party (BAP) became the largest party in Balochistan. In Punjab, a hung parliament prevailed with Pakistan Muslim League (N) (PML-N) emerging as the largest party in terms of directly elected seats by a narrow margin. However, following the joinings of many independent MPAs into the PTI, it became the largest party and formed the government. However, Election Commission of Pakistan (ECP) outrightly rejected such reports of rigging and stated that elections were conducted fair and free. A top electoral watchdog, Free and Fair Election Network (Fafen), also said that the 2018 general elections in Pakistan have been “more transparent in some aspects” than the previous polls. The European Union Election Observation Mission said, in its preliminary report, that no rigging has been found during the election day in general. The European Union assessed the conduct of polling on election day as "transparent". This was also the third consecutive election from Pakistan's most recent transition to democracy where a democratic handover of power was observed. Following the elections in 2013, Pakistan Muslim League (Nawaz), led by twice Prime Minister of Pakistan Nawaz Sharif, emerged as the largest party with 166 seats out of a total of 342 in the National Assembly. Although this was short of a majority, Sharif was able to form a government after several independents joined his party. During the election campaign, Pakistan Tehreek-e-Insaf (PTI), led by prominent cricketer turned politician Imran Khan, was widely expected to have huge success in the polls. The party fell short of these expectations, instead only taking 35 seats. It became the 3rd largest party in the National Assembly and formed a coalition government in the restive north-western province of Khyber Pakhtunkhwa. PTI had initially conceded the elections to PML (N), although they asked for manual recounts to be carried out in several constituencies where rigging had been allegedly carried out. These calls were not answered by the government or the Supreme Court, despite a 2,100 page white paper by the party which allegedly contained evidence of vote-rigging in favour of the PML (N). An ‘Azadi March’ was started by Khan on 14 August 2014 which demanded the government to call a snap election. The sit-in in Islamabad continued for 126 days, until the 2014 Peshawar school massacre occurred, which forced Khan to end the protest for the sake of ‘national unity’. A judicial commission was formed by the government which would probe the allegations of vote-rigging: it found the election to have been largely conducted in a free and fair manner, while also stating that PTI's request for a probe was not "entirely unjustified". On 3 April 2016 the International Consortium of Investigative Journalists (ICIJ) made 11.5 million secret documents, later known as the Panama Papers, available to the public. The documents, sourced from Panamanian law firm Mossack Fonseca, among other revelations about other public figures in many other countries, included details of eight offshore companies with links to the family of Nawaz Sharif, the then-incumbent Prime Minister of Pakistan, and his brother Shehbaz Sharif, the incumbent Chief Minister of Punjab. According to the ICIJ, Sharif's children Maryam Nawaz, Hassan Nawaz and Hussain Nawaz “were owners or had the right to authorise transactions for several companies”. Sharif refused to resign and instead make an unsuccessful attempt to form a judicial commission. The opposition leader Khan filed a petition to the Supreme Court of Pakistan on 29 August seeking the disqualification of Sharif from the premiership and as a member of the National Assembly. Political leaders Sheikh Rasheed and Siraj-ul-Haq also supported this petition. Khan called, once again, for his supporters to put Islamabad in lockdown until Sharif resigned, although this was called off soon before it was meant to take place. On 20 April 2017, on a 3-2 verdict, the Supreme Court decided against the disqualification of Sharif, instead calling for a Joint Investigation Team (JIT) to be created which would probe these allegations further. On 10 July 2017, JIT submitted a 275-page report in the apex court. The report requested NAB to file a reference against Sharif, his daughter Maryam, and his sons under section 9 of National Accountability Ordinance. Additionally, the report claimed that his daughter Maryam was guilty of falsifying documents, as she submitted a document from 2006 which used the Calibri font despite the font itself not being available for public use until 2007. On 28 July 2017, following the submittal of the JIT report, the Supreme Court unanimously decided that Sharif was dishonest, therefore not fulfilling the requirements of articles 62 and 63 of the constitution which require one who holds public office to be Sadiq and Ameen (Urdu for Truthful and Virtuous). Hence, he was disqualified as Prime Minister and as a Member of the National Assembly. The court also ordered National Accountability Bureau to file a reference against Sharif, his family and his former Finance Minister Ishaq Dar on corruption charges. 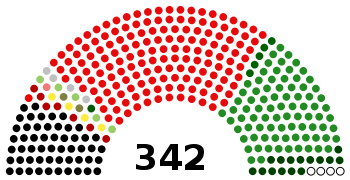 The 342 members of the National Assembly are elected by two methods in three categories; 272 are elected in single-member constituencies by first-past-the-post voting; 60 are reserved for females and 10 for religious minority groups; both sets of reserved seats use proportional representation with a 5% electoral threshold. This proportional number, however, is based on the number of seats won rather than votes cast. To win a simple majority, a party would have to take 137 seats. The 2018 General Elections were held under new delimitation can of constituencies as a result of 2017 Census of Pakistan. Parliament of Pakistan amended the Constitution, allowing a one-time exemption for redrawing constituency boundaries using 2017 provisional census results. As per the notification issued on 5 March 2018, the Islamabad Capital Territory (ICT) now has three constituencies, Punjab 141, Sindh 61, Khyber Pakhtunkhwa 39, Balochistan 16 and Federally Administered Tribal Areas (FATA) has 12 constituencies in the National Assembly. 106 million people were registered to vote for members of the National Assembly of Pakistan and four Provincial Assemblies. Likewise for elections to provincial assemblies, Punjab has 297 constituencies, Sindh 130, Khyber Pakhtunkhwa 99 and Balochistan 51. In June 2017 the Economic Coordination Committee approved the procurement of new printing machines with a bridge loan of 864 million rupees. The government has also developed new software for the Election Commission of Pakistan and NADRA to ensure a "free, fair, impartial, transparent and peaceful general election." The former Federal Law Minister Zahid Hamid elaborated that youth reaching the age of 18 will automatically be registered as voters when they apply for a CNIC from NADRA. Following the disqualification of Nawaz Sharif, several by-elections were held throughout Pakistan. The first of these was the by-election in Sharif's former constituency, NA-120 Lahore, which is located in the capital city of the Punjab province, a province where the PML (N) was the ruling party. It retained this seat, albeit with a much reduced majority due to gains by the PTI and minor Islamist parties. The second of these was a by election in Peshawar, capital city of the Khyber Pakhtunkhwa province, where the Pakistan Tehreek-e-Insaf| was the ruling party. NA-4 once again voted for PTI, despite a reduced majority: once again mainly due to the rise of Islamist parties. These by-elections largely were largely seen as indicators that the ruling parties in both Khyber Pakhtunkhwa and Punjab were still electorally strong. On 15 December 2018, Jahangir Khan Tareen, General Secretary of the PTI, was disqualified from holding public office. Hence, his NA-154 Lodhran seat was vacated. In a previous by-election in this constituency in 2015, Tareen won this seat with a majority in excess of 35,000 votes. Therefore, this seat was seen as a stronghold for the PTI. In what was seen as an upset result, Iqbal Shah of the PML (N) won this by-election with a majority over 25,000 votes against Jahangir Tareen's son, Ali Tareen. Many saw this as a failure on the PTI's behalf, and the result led to a drop in morale for PTI workers. The National Assembly and provincial assemblies of Pakistan dissolved as early as 28 May for Khyber Pakhtunkhwa and Sindh, and as late as 31 May for Punjab, Balochistan, and the National Assembly. The assemblies dissolved during the holy month of Ramadan, a month where Muslims worldwide refrain from eating or drinking from sunrise to sundown. Hence, most major parties did not start campaigning until late June. On 4 June, parties and individuals started filing nomination papers for the elections. This process continued until 8 June. After this, the returning officer in each constituency began scrutiny of the nominated candidates and decided whether or not to accept the nomination papers. The scrutiny resulted in many high-profile politicians having their nomination papers rejected: Imran Khan (chairman of PTI), Farooq Sattar (chairman of Muttahida Qaumi Movement (Pakistan) (MQM-P) and Pervez Musharraf (chairman of All Pakistan Muslim League and former President), had their nomination papers rejected. Both Sattar and Khan had their nomination papers later accepted. Additionally, politicians Fawad Chaudhry (Information Secretary of PTI) and Shahid Khaqan Abbasi (former Prime Minister) were disqualified from contesting these elections by election tribunals due to the non declaration of assets in their nomination papers. This was controversial because election tribunals were seen as not having the jurisdiction to disqualify candidates, rather only to accept or reject their nomination papers. The Lahore High Court eventually overturned these judgements and allowed the respective candidates to contest their elections. Two major politicians of Tehreek-e-Insaf from Chakwal, Sardar Ghulam Abbas and Sardar Aftab Akbar Khan were disqualified to contest elections producing major problem in Chakwal district for the party. Pakistan Muslim League (Nawaz) launched its election campaign on 25 June 2018 from Karachi. On 5 July 2018, PMLN unveiled its election manifesto. Nevertheless it has been stated there was, "lack of equality of opportunity" in the pre-election campaign, and there were systematic attempts to undermine the ruling party PML-N.
Pakistan Tehreek-e-Insaf started its election campaign on 24 June 2018 from Mianwali. On 9 July 2018, Imran Khan launched PTI's election manifesto. On 23 July 2018, PTI concluded its electioneering with rallies in Lahore. On 28 June 2018, PPP became the first political party to unveil its election manifesto. PPP kicked off its election campaign on 30 June 2018, as Bilawal inaugurated their election office in Lyari, Karachi. Each coloured line specifies a political party and how strong their voting intention is nationwide for the National Assembly, based on a 3-point moving average. Parties which poll below 10% are not shown. *Muttahida Majlis-e-Amal is an alliance of Islamist political parties, formed in 2002 and dissolved after the 2008 elections. The restoration of this alliance occurred in December 2017. Polls conducted before the restoration show the sum for Jamiat Ulema-e-Islam (F), the major political party in this alliance. There were 272 national and 577 provincial assembly constituencies, contested by over 3,600 and 8,800 candidates respectively. A total of 811,491 staff were deployed for election duties as presiding officers, assistant presiding officers, and polling officers, in addition to 371,000 armed forces personnel who provided security duties alongside police and other law enforcement agencies. There were 85,317 polling stations set up, comprising over 242,000 polling booths. In the beginning of July, a bombing took place in Ramzak tehsil of North Waziristan at the office of Malik Aurangzeb Khan, PTI's candidate for NA-48 (Tribal Area-IX) leaving 10 people injured. On 7 July, a bomb planted in a motorcycle was remotely exploded at an election campaign of Muttahida Majlis-e-Amal's PK–89 candidate Shein Malik in the Takhti Khel area of the Bannu. On 10 July, a suicide bombing attack claimed by Tehrik-i-Taliban Pakistan (TTP) on political rally of Awami National Party (ANP) in Yakatoot neighborhood of Peshawar left twenty people dead and sixty three others injured. Among the killed was ANP's Khyber Pakhtunkhwa Assembly candidate, Haroon Bilour. Following Bilour's death, elections for Constituency PK-78 were postponed to an disclosed date by the Election Commission. On 12 July, a spokesperson for former Member of National Assembly Alhaj Shah Jee Gul Afridi was killed and another citizen was injured after unidentified men opened fire at the spokesperson's car in Peshawar. On the same day, the Balochistan Awami Party (BAP)'s office in Khuzdar came under gunfire before a bomb detonated injuring 2 people. On 13 July, two separate bombings on election rallies in Mastung and Bannu left 154 people dead and injured more than 220 others. In Bannu, 4 citizens were killed and 10 were injured after a planted bomb exploded near the car of JUI-F candidate Akram Khan Durrani. In Mastung, a suicide bomber affiliated with Islamic State of Iraq and the Levant (ISIL) blew himself up at the election rally of Balochistan Awami Party's candidate for the Balochistan Assembly, Nawabzada Siraj Raisani, killing him and 148 others people and injured over 186. On 22 July, PTI's candidate for constituency PK-99 Ikramullah Gandapur and his driver were killed after a suicide bomber blew himself near his car as he was headed towards a corner meeting in the outskirts of Dera Ismail Khan. The same day, unknown gunmen opened fires on the vehicle of Durrani in Bannu. No one was hurt during firing as the vehicle was bulletproof. This was second unsuccessful attempt to assassinate Durrani and third terrorist incident in the city in the span of two weeks. On 24 July, four people were killed including three Pakistani Army soldiers in Kech District, Balochistan. On 25 July, during polling in Quetta, a bomb went off which resulted in 31 people being killed and 35 injured. In Swabi, a city in the northern province of Khyber Pakhtunkhwa, one person was killed and three injured after PTI supporters exchanged fire with those from the secularist Awami National Party (ANP). At least three other people were injured in a grenade attack outside a polling station in Larkana, in the southern province of Sindh. In Khanewal, a man was shot dead and another one was injured in a political clash. Several more people were injured in 7 other incidents. There have been allegations by some international journalists and scholars, claiming that there was a plan between judiciary and military bodies to influence the outcome of the election. These allegations were also made by the outgoing PML-N following Nawaz Sharif's disqualification for corruption. It was suggested that alleged goal of these attempts was to halt the party of Nawaz Sharif from coming into power and to bring the results in favor of PTI, so that Imran Khan – who is alleged as close to the military – can be installed as the prime minister. Khan has denied these allegations as a "foreign conspiracy" and "against the facts" , while the military also categorically rejected them. There have been claims of PML (N)'s campaign material being ripped apart by authorities while leaving alone material belonging to PTI. There have been suggestions that candidates belonging to PML (N) have been coerced by ISI to switch to those parties whose future government can be better controlled by military. On the last day of scrutiny of nomination papers, seven PML (N) candidates from Southern Punjab returned their tickets leaving no option for PML (N) to field replacement candidates, depriving them an opportunity to win those seats. There have also been reports of election engineering by army and intelligence agencies in Balochistan province in favor of Balochistan Awami Party. Reports further suggested that there was evidence of collusion between the judiciary and military, in that two military officials were appointed to the Joint Investigation Team to investigate corruption allegations against former prime minister Nawaz Sharif, which were further strengthened by the circumstances of the Avenfield case verdict against the Sharifs. Justice Shaukat Aziz Siddiqui, an Islamabad High Court senior justice, released a statement on 22 July alleging that judges were pressured by ISI not to release Sharif before the election. However, he provided no evidence and was at the time facing corruption and misconduct charges pending at the Supreme Judicial Council, leading to rumours about the timing of his statement. Pakistan's Chief Justice Saqib Nisar said he felt "saddened" at Siddiqui's comments, and whilst criticising them, stated that "as the head of judiciary, I assure you that we are not under any sort of pressure". There have been allegations that the micromanagement of political parties and the censorship of the newspapers, social media and TV channels is to further influence the election result. An official from the Human Rights Commission of Pakistan stated that "The level of army interference and political engineering is unprecedented." Another institution, the National Accountability Bureau has been described as being used by military intelligence agencies, including ISI, to bring politicians in line by threatening to bring corruption cases against them. Due to interference by military and intelligence agencies, The Financial Times described these elections as "the dirtiest in years". Furthermore, the EU observer mission released their report after the election stating that there were "systematic attempts to undermine the ruling party", "lack of equality of opportunity", pressure on the media, far stronger efforts than usual to encourage switching parties and judicial conduct had all negatively influenced the vote. Some of these allegations have also been made by certain political parties and figures more prominently by PML (N). Among the politicians, Farhatullah Babar has been very vocal against the election meddling by military describing it as a "creeping coup against civilian authority". Raza Rabbani also leveled same allegations including the Election Commission of Pakistan, National Accountability Bureau and security agencies as the culprit behind pre-poll rigging. Almost all political parties, with the exception of PTI, have alleged large scale election day rigging. The winning PTI have alleged rigging in some constituencies as well. Doubts were raised by unprecedented delays in the declaration of results. The fairness of the election was also criticized due to the Election Commission's failure to provide Form 45s, official forms which include the tally of votes and are prepared in the presence of political agents of all the candidates. Party leaders alleged that their representatives were barred from polling stations before counting began and the Form 45s were prepared in their absence and behind closed doors. In some instances, the representatives were given results on plain paper instead of official forms. In another instance, the presiding officer signed blank forms, allowing the possibility of results being manipulated afterwards. Independent candidate Jibran Nasir also made similar allegations. There was also an incident of seven people being arrested for alleged vote rigging in Karachi. According to FAFEN observer Sarwar Bari, "Only one polling agent of every party is allowed when Form 45 is given out by the polling staff, so we can’t rule out the fact that it could be a misunderstanding." A few days after the election, in the NA-241 (Korangi Karachi-III) constituency, ballots cast for candidates of PML (N), PPP, and MQM-P were found in a garbage heap. A PTI candidate won the election in that constituency. Chairman of winning party Imran Khan pledged that he will allow to open any constituency his opponents think are rigged, he said that opposition has full right into recounting or accountability over election process to ensure transparency. The Free and Fair Election Network, an election watchdog, said the 2018 polls were "more transparent" in some aspects than the previous elections and that "significant improvements in the quality of critical electoral processes" inspired "greater public confidence". According to former Indian Chief Election Commissioner S. Y. Quraishi, a member of the international observers group in Pakistan, the election system was transparent, free and fair, and the minor technical glitches which showed up later in the day were due to inexperience. On 12 August 2018, it was reported that 90% of Form-45s were not signed by any polling agent, which is a violation of Election Act 2017. However, an ECP spokesperson clarified the discrepancy by stating that there was no designated space on the Form-45s to obtain the signatures of polling agents. The signatures were instead done on tamper-evident bags that were used to transport the results. For the transparency reasons and to combat controversy surrounding form 45, election commission of Pakistan published all form 45 publicly on their website. Despite rejecting the results of the election due to alleged rigging, the Pakistan Muslim League (N) made the decision to take oath in the elected assemblies for the sake of democracy, conceding that Pakistan Tehreek-e-Insaf’s Imran Khan was likely to be the Prime Minister. Hence, the government formation at the federal level was left to the PTI alone. Talks began with smaller parties and independents to form a government. Muttahida Qaumi Movement which won six seats, Pakistan Muslim League (Q) which won four, Balochistan Awami Party which won four, Grand Democratic Alliance which won two, and thirteen independent candidates were invited to join the PTI-led government. Additionally, Awami Muslim League led by Sheikh Rasheed Ahmed, the party’s only MNA, had already vowed its support to PTI before the elections. On 28 July, PML (Q) pledged its support to PTI’s candidates for Chief Minister of Punjab, making it unlikely to oppose PTI in the National Assembly. On 31 July, Balochistan Awami Party announced its support for a PTI led federal government. On 1 August, Muttahida Qaumi Movement was told by the PPP that it had to choose between sitting in a coalition with them in Sindh or sitting in a coalition with PTI in the centre. On the same day, MQM-P convener Khalid Maqbool Siddiqui announced the party’s six MNAs would lend their support to the PTI in the National Assembly. On 2 August, Pakistan Muslim League (N), Pakistan Peoples Party, Muttahida Majlis-e-Amal and Awami National Party announced to form a “Grand Opposition Alliance” whereby the Speaker, Prime Minister and other key posts would be jointly nominated and elected. The Speakership would be given to the PPP, the Deputy Speakership to the MMA and the Premiership to the PML-N. However, on 16 August, after the elections for speaker, PPP decided to withdraw their support for Shehbaz Sharif for the post of Prime Minister, owing to previous statements made by the individual about the party's co-chairman and ex-President of Pakistan, Asif Ali Zardari. Over the next few weeks, other parties pledged their support towards the PTI nominees for speaker, deputy speaker. These parties include Balochistan National Party (Mengal), Grand Democratic Alliance and Jamhoori Watan Party. In addition to this, 9 independents joined the party. The election for the Speaker and Deputy Speaker of the National Assembly took place on 15 August 2018. The election for the premiership took place on 17 August 2018. As the results began to pour in, many of the main opposition parties declared that the elections were not 'free and fair'. The Election Commission of Pakistan denied the allegations but announced that it would be willing to investigate if proof was provided. PTI chairman Imran Khan also addressed the allegations in his first national address and said that he would be willing to look into any allegations of rigging. He also added that he thought that the elections were the "cleanest in Pakistan's history." Celebrations across Pakistan also erupted as early results indicated a win for Tehreek-e-Insaf. Khan's fellow cricketers and celebrities took to Twitter in celebration of his assumed victory even before election results were finalized or a government formed. The Pakistan Stock Exchange (PSX) reacted positively and opened 2% higher as the prospect of a hung government dissipated. The KSE index closed 749 points higher on Thursday. On 3 July 2018, the benchmark KSE-100 index gained 314 points to reach 43,100 points. It closed up 770 points at 43,556 points. The US dollar shed Rs5.36 against the rupee in the inter-bank market for the first time in four years, falling to Rs122.5. The positive economic indicators are considered to be largely driven by what investors consider the return of political stability following the 25 July polls. ^ "Assembly Wise Voters Turnout". Ecp.gov.pk. Retrieved 7 August 2018. ^ a b "The assault on Pakistan media ahead of vote". Bbc.com. 4 July 2018. Retrieved 7 July 2018. ^ a b c d Fair, C. Christine (27 July 2018). "Pakistan's Sham Election". Foreign Affairs. Retrieved 6 August 2018. ^ "Ex-cricketer Khan leads Pakistan elections in early counting". BBC News. 26 July 2018. Retrieved 27 July 2018. ^ Gannon, Kathy (26 July 2018). "Unofficial Results in Pakistan's Election Show Lead For Imran Khan, But Opponents Allege Fraud". TIME Magazine. Retrieved 26 July 2018. ^ Shah, Saeed (25 July 2018). "Ex-Cricket Star Imran Khan Headed for Pakistan Election Victory". Wall Street Journal. Retrieved 26 July 2018. ^ "Blow after blow dims re-election hopes of Pakistan's ruling party". 11 May 2018 – via uk.reuters.com. ^ "Pakistan's ex-PM Nawaz Sharif slammed for Mumbai attack comments". www.aljazeera.com. ^ "Pakistan election: Party of Ex-PM Nawaz Sharif concedes to Imran Khan". ^ "ECP rejects political parties' claim of 'rigging' on election day". ^ "'PML-N rejects poll results,' declares Shahbaz Sharif". Dawn. 25 July 2018. Retrieved 26 July 2018. ^ "FAFEN satisfied with transparency of polls, urges ECP to allay opposition's concerns". 27 July 2018. ^ a b Barker, Memphis (27 July 2018). "EU piles pressure on Imran Khan after Pakistan election". theguardian.com. Retrieved 28 July 2018. ^ "EU monitors team says Pakistan election not a level playing field". Geo TV news. 28 July 2018. ^ Iqbal, Anwar (7 July 2018). "Democratic transfer of power in Pakistan must continue, says Wells". DAWN.COM. Retrieved 14 April 2019. ^ "Nawaz Sharif's PML-N emerges as single largest party in Pak polls". Zeenews. 14 May 2013. Retrieved 22 July 2013. ^ "Imran Khan: 'Pakistan will never be the same again'". BBC News. 12 May 2013. Retrieved 26 July 2018. ^ "PTI concedes defeat in Pakistan elections". The Express Tribune. AFP. 23 February 2011. Retrieved 13 May 2013. ^ "Imran demands recount with fingerprint verification on 4 constituencies". Retrieved 16 September 2015. ^ "For a national cause: PTI calls off dharna after 126 days". Express Tribune. 18 December 2014. ^ "JC finds 2013 elections fair and in accordance with law". 23 July 2015. ^ Cheema, Umer. "House of Sharifs Named In Panama Papers". Centre for Investigative Reporting in Pakistan. CIRP. Archived from the original on 29 April 2017. Retrieved 11 April 2017. ^ "Giant leak of offshore financial records exposes global array of crime and corruption". OCCRP. The International Consortium of Investigative Journalists. 3 April 2016. Archived from the original on 4 April 2016. ^ Ghumman, Khawar (7 October 2016). "Imran plans siege of Islamabad on Oct 30". Dawn. Dawn Group. Retrieved 11 April 2017. ^ "Meet the SC judges behind the Panama Papers ruling". Dawn.com. ^ "Complete Report of Joint Investigation Team (JIT) in Panama Case". SUCH TV. SUCH TV NEWS. 2017. ^ "JIT report raises doubts about use of 'Calibri' font in papers submitted by Maryam". Dawn.com. Retrieved 11 July 2017. ^ "Sadiq and Ameen". Thenation.com.pk. 28 July 2017. Retrieved 17 June 2018. ^ Bhatti, Haseeb (28 July 2017). "Nawaz Sharif steps down as PM after SC's disqualification verdict". Dawn. ^ "Panama Case verdict: Pakistan Supreme Court disqualifies PM Nawaz Sharif". Daily Pakistan. 28 July 2017. Retrieved 28 July 2017. ^ "Pakistan polls: Jailed Sharif's PML-N takes guard against Imran's PTI". ^ "The Pathan Suits: Can Imran Khan Lay A New Path For Pakistan's Fractured Polity?". ^ "Election for Pakistani National Assembly". IEFS. 11 May 2013. Retrieved 8 May 2017. ^ Chalmers, John. "Pakistan marks democratic milestone in close-fought election". U.S. Retrieved 29 June 2018. ^ "Elections 101: What is delimitation and why does it matter?". ^ "How constituency boundaries were redrawn across Pakistan". ^ "Complete list of National Assembly constituencies for General Elections 2018 – Dispatch News Desk". dnd.com.pk. 7 March 2018. Retrieved 26 May 2018. ^ "Download Polling Scheme of Sindh for National Assembly General Elections 2018 – Dispatch News Desk". dnd.com.pk. 26 May 2018. Retrieved 26 May 2018. ^ "Download Polling Scheme for Balochistan Provincial Assembly General Elections 2018 – Dispatch News Desk". dnd.com.pk. 26 May 2018. Retrieved 26 May 2018. ^ "Voting ends in Pakistan; 35 killed in suicide blast, poll-related violence". ^ "General elections 2018: ECC approves Rs864m for procuring new printing machines". The News International. 8 June 2017. Retrieved 11 June 2017. ^ a b "Next general election to be held on time: Zahid Hamid". The Nation. 11 June 2017. Retrieved 11 June 2017. ^ "Official result of NA-120 announced, Kulsoom polls 61,745 votes". dunya.tv. 20 September 2017. ^ "PTI's Arbab Amir wins NA-4 by-election with reasonable margin: unofficial results". dunya.tv. 26 October 2017. ^ "Imran Khan gets clean chit, Jahangir Khan Tareen disqualified". www.thenews.com.pk. Retrieved 15 December 2017. ^ "PML-N candidate poised to win by-polls in NA-154 Lodhran". dawn.com. 13 February 2018. ^ "National Assembly stands dissolved as second successive democratic government completes five-year term". Dawn.com. 1 June 2018. ^ "Imran to kick-start PTI's election campaign from Mianwali today". Geo.tv. 24 June 2018. ^ "ECP: Change in date of filing nomination papers". 6 June 2018. ^ "Nomination papers of Sattar, Musharraf rejected". Geo.tv. Retrieved 6 July 2018. ^ Agencies. "Imran Khan's nomination papers rejected". gulfnews.com. Retrieved 6 July 2018. ^ "PTI chief Imran Khan allowed to contest polls from NA-53, NA-35". geo.tv. Retrieved 6 July 2018. ^ Bilal, Rana (28 June 2018). "LHC suspends appellate tribunal's disqualification verdict against PTI's Fawad Chaudhry". dawn.com. Retrieved 6 July 2018. ^ Bilal, Rana (29 June 2018). "LHC suspends tribunal decision on Abbasi's disqualification for life". dawn.com. Retrieved 6 July 2018. ^ "PTI left without candidate in NA-64". dawn.com. 28 June 2018. ^ "Shahbaz launches PML-N election campaign from Karachi". Dawn. 26 June 2018. Retrieved 25 July 2018. ^ "PML-N unveils party manifesto for elections 2018". The News International. 5 July 2018. Retrieved 25 July 2018. ^ "PTI to kick-start election campaign from Mianwali". Express Tribune. 23 June 2018. Retrieved 25 July 2018. ^ "Imran Khan launches PTI manifesto for General Election 2018". The News International. 9 July 2018. Retrieved 25 July 2018. ^ "Election campaign ends amid PTI, PML-N power shows". Samaa TV. 24 July 2018. Retrieved 25 July 2018. ^ "PPP unveils election manifesto promising to 'save and develop Pakistan'". Express Tribune. 28 June 2018. Retrieved 25 July 2018. ^ "Bilawal kicks off election campaign from Karachi". Express Tribune. 1 July 2018. Retrieved 25 July 2018. ^ "Survey shows elections too close to call". ^ "National Survey of Current Political Survey in Pakistan" (PDF). ^ a b "Elections Exclusive: 3 poll results in! Who will you vote for Pakistan?". geo.tv. ^ "Dr. Ijaz Shafi Gilani, Chairman Gallup Pakistan talks about the changing trends in public opinion and motivations of the voters with respect to the upcoming Election on Jirga with SaleemKhanSafi on Geo News". Gallup Pakistan. 21 May 2018. ^ Shah, Saeed (25 April 2018). "Trial of Ex-Leader Rattles Pakistan's Democracy". [www.wsj.com]. ^ a b Elahi, Manzar; Haider, Sajjad (24 November 2017). "PML-N remains most popular party, Nawaz most favourite leader: survey". Geo TV. ^ "Shehbaz favoured by Pakistan's majority to become premier: GSP survey". Dunya News. 28 October 2017. ^ "National Public Opinion Survey". Global Strategic Partners. 24 October 2017. ^ "Party wise total vote bank" (PDF). Government of Pakistan. 27 May 2013. Archived from the original (PDF) on 8 October 2017. ^ a b c d Hamdani, Kazim (27 July 2018). "FAFEN satisfied with transparency of polls, urges ECP to allay opposition's concerns". The Express Tribune. Retrieved 28 July 2018. ^ Jamal, Sana (4 July 2018). "More than 12,000 contesting Pakistan Elections 2018". Gulf News. Retrieved 28 July 2018. ^ Ali, Akbar (3 July 2018). "10 injured in blast at PTI candidate's election office in North Waziristan". Dawn. Retrieved 14 July 2018. ^ "7 including MMA candidate injured in Bannu blast". Dawn. 7 July 2018. Retrieved 14 July 2018. ^ "ANP's Haroon Bilour among 20 martyred in Peshawar suicide attack". The News International. 11 July 2018. Archived from the original on 10 July 2018. Retrieved 11 July 2018. ^ "Political worker shot dead in Peshawar". Tribune.com.pk. Retrieved 12 July 2018. ^ Syed, Ali Shah (12 July 2018). "2 injured in blast near political party's office in Khuzdar". Dawn. Retrieved 14 July 2018. ^ "Four killed as blast targets JUI-F leader Akram Khan Durrani's convoy in Bannu". Geo.tv. Retrieved 13 July 2018. ^ "Death toll in Mastung blast escalates to 131". Dunya News. Retrieved 15 July 2018. ^ "PTI's Ikramullah Khan Gandapur martyred in DI Khan suicide blast". Express Tribune. Retrieved 22 July 2018. ^ "JUI-F leader Akram Durrani safe as shots fired at vehicle in Bannu". Geo News. 22 July 2018. Retrieved 25 July 2018. ^ "Three security personnel among four martyred in Balochistan gun attack: ISPR". The News. 25 July 2018. Retrieved 26 July 2018. ^ "Six policemen among 29 martyred in suicide attack outside Quetta polling station". Retrieved 25 July 2018. ^ "PTI worker shot dead in clash with ANP supporters in Swabi". Retrieved 25 July 2018. ^ "At least three injured in explosion outside polling station in Larkana". Retrieved 25 July 2018. ^ "Clashes, violence mar polling in various constituencies; at least 2 killed". DAWN.COM. 25 July 2018. Retrieved 25 July 2018. ^ a b Mir, Asfandyar (26 July 2018). "What just happened in Pakistan's election? And what happens next?". Washington Post. Retrieved 28 July 2018. ^ a b "Pakistan: General Elections Subverted By Army-Judiciary Nexus – Analysis". eurasiareview.com. 6 July 2018. Retrieved 6 July 2018. ^ Aziz, Saba (26 July 2018). "Pakistan elections: Who is Imran Khan?". Al Jazeera. Retrieved 28 July 2018. ^ "Nawaz Sharif: Pakistan's army yet again takes on the wrong fight – The Economic Times". economictimes.com. Retrieved 16 July 2018. ^ a b "Pakistan elections around the corner, but many say results already decided". hindustantimes.com. Retrieved 8 July 2018. ^ Shah, Saeed; Gillani, Waqar (20 July 2018). "Pakistan's Military Wields More Influence Ahead of National Election". Wsj.com. Retrieved 21 July 2018. ^ Birmani, Tariq Saeed; Faheem, Kanwer; Ali, Mohammad (30 June 2018). "PML-N's troubles continue as 7 candidates in south Punjab return party tickets". dawn.com. Retrieved 6 July 2018. ^ "Shadow of 'engineering' hangs over Pakistan election". Aljazeera.com. Retrieved 16 July 2018. ^ "Pakistan election raises fears of 'creeping coup'". Bbc.com. 23 July 2018. Retrieved 24 July 2018. ^ Reporter, The Newspaper's Staff (22 July 2018). "Justice Shaukat sees erosion of independence of judiciary". dawn.com. Retrieved 24 July 2018. ^ Naseer, Tahir (21 July 2018). "IHC judge makes startling allegations against security agencies 'meddling' in judicial affairs". Dawn. Retrieved 28 July 2018. ^ a b "CJP Nisar responds angrily to Justice Shaukat's statement". The News. 22 July 2018. Retrieved 28 July 2018. ^ "In Pre-Election Pakistan, a Military Crackdown Is the Real Issue". nytimes.com. Retrieved 11 July 2018. ^ "Pakistan heads for dirtiest election in years". amp.ft.com. Retrieved 22 July 2018. ^ Guramani, Nadir (12 June 2018). "'Creeping coup' underway in lead-up to election, alleges Babar". dawn.com. Retrieved 28 July 2018. ^ "Raza Rabbani, accuses NAB, judiciary, ECP of pre-poll rigging - Global Village Space". globalvillagespace.com. 13 July 2018. Retrieved 28 July 2018. ^ "'Dirtiest Polls in Pakistan's History': Shehbaz Sharif Says Blatant Rigging Taking Nation 30 Years Back". News18.com. Retrieved 6 August 2018. ^ Rajat Sharma (26 July 2018). "Pakistan Polls: Parties allege large scale rigging". Aninews.in. Retrieved 12 August 2018. ^ "Here's a list of constituencies where PTI, PML-N, PPP are alleging rigging". 29 July 2018. ^ "Pakistan Election Results 2018 updates: 5 parties allege poll rigging as PTI emerges in lead; Imran Khan's party says open to recounting". firstpost.com. Retrieved 28 July 2018. ^ a b c d "Pakistan Election 2018: PPP, PML-N allege large-scale rigging as PTI widens lead - Latest News & Updates at Daily News & Analysis". Dnaindia.com. Retrieved 28 July 2018. ^ "Political parties protest against irregularity in vote counting". nation.com.pk. 25 July 2018. Retrieved 28 July 2018. ^ "Karachi: 7, including a woman, arrested from polling stations in NA-238". Retrieved 22 July 2018. ^ "Stamped ballot papers recovered from garbage dump in Karachi". Geo.tv. Retrieved 28 July 2018. ^ "Imran Khan's speech in full: READ new Pakistan leaders complete victory speech in English". 26 July 2018. ^ "Pakistan Elections Free And Fair, Says Indian Observer SY Quraishi". NDTV. 26 July 2018. Retrieved 28 July 2018. ^ "اہم خبریں - 90 فیصد سے زائد فارم 45 پر پولنگ ایجنٹوں کے دستخط نہیں". Daily Jang. ^ Durrani, Fakhar (12 August 2018). "More than 90pc Form-45 not signed by polling agents". The News. ^ "ECP uploads Form 45, others containing election results data on its website". The Dawn. 8 August 2018. ^ "PTI's NA total rises to 158 after addition of 33 reserved seats". Geo.tv. ^ "Pakistan election: Party of Ex-PM Nawaz Sharif concedes to Imran Khan". 27 July 2018. ^ "Pakistan election: Imran Khan begins coalition talks as opposition parties protest 'rigged' vote". ^ "Number games for Punjab CM: PML-Q gives thumbs down to PML-N". ^ "BAP announces support for PTI in National Assembly". geo.tv. Retrieved 6 August 2018. ^ "MQM-P lends support to PTI in forming federal govt - The Express Tribune". tribune.com.pk. Retrieved 6 August 2018. ^ "'Opposition' parties resolve to bring their own prime minister, NA speaker". dawn.com. 2 August 2018. ^ a b "PPP withdraws support for Shehbaz Sharif as PM candidate | Pakistan". Geo.tv. 16 August 2018. Retrieved 22 August 2018. ^ "BNP-M, PTI deal secures Mengal's support for Imran at centre | Pakistan". Geo.tv. 9 August 2018. Retrieved 22 August 2018. ^ (9 August 2018). "GDA assures unconditional support to PTI - Pakistan". Dunya News. Retrieved 22 August 2018. ^ "Shahzain Bugti announces support for Imran Khan - Pakistan". Dawn. 8 August 2018. Retrieved 22 August 2018. ^ "PTI's Asad Qaiser, Qasim Suri elected NA speaker and deputy speaker amid opposition ruckus". dawn.com. 15 August 2018. ^ "Imran Khan elected as Pakistan's prime minister". aljazeera.com. 17 August 2018. ^ "Election body rejects 'rigging' accusations". thenews.com.pk. Retrieved 6 August 2018. ^ "Imran Khan says ready to investigate rigging claims". thenews.com.pk. Retrieved 6 August 2018. ^ "Will aid in probing opposition's rigging allegations: Imran Khan". geo.tv. Retrieved 28 July 2018. ^ Report, Asma Ali Zain/ Web. "ECP officially declares Imran Khan's PTI as winner". m.khaleejtimes.com. Retrieved 28 July 2018. ^ First Post staff (26 July 2018). "Pakistan General Elections 2018: Twitter reacts to Imran Khan's win; '...my sons' father is Pakistan's next PM', tweets Jemima". First Post. Retrieved 28 July 2018. ^ "Pakistan stock exchange remains bullish, gains 749 points in post election rally". arabnews.com. 26 July 2018. Retrieved 28 July 2018. ^ "In a first in four years, dollar falls by Rs5.36 in interbank market". Geo News. 30 July 2018. Retrieved 30 July 2018.